The world reacted with horror and outrage Sunday at allegations of another chemical attack in Syria. The US, UK, and France are discussing retaliatory measures. Yesterday, President Trump promised “major decisions” within 24-48 hours concerning a possible strike. Today at the UN Security Council, the US and Russia traded accusations—the US condemning Russia for “protecting a monster,” while Russia claimed the attack was staged to give the US a pretext for military intervention. Meanwhile, the human cost continues to be felt in the Damascus suburb of Douma. Several dozen people are said to have been killed. More than 500 are reportedly injured. And tens of thousands are being forced to flee—on top of the 130,000 who had already fled in recent weeks. But what the media isn’t telling you is that none of this is new. Chances are, the last time you heard about chemical weapons in Syria was April 2017, when 100 people died in an alleged sarin gas attack. The latest attack in Douma marks the first time in over a year that reporters and world leaders have paid serious attention to chemical warfare in Syria. This is at least the third alleged use of chemical weapons in Syria this year alone. One of our colleagues has described seeing what may have been chemical rockets flying over Damascus. For the people of Syria, this nightmare doesn’t go away when the cameras turn off and the world’s interest turns to other matters. But even though the world’s concern is frustratingly short-lived, yours is not. You’ve been serving families from this part of Syria for weeks, supporting a medical clinic a mile from the site of the alleged attack. Even before the bombs fell Sunday, you’d already provided urgent medical care for thousands of children, women, and men on the run from war. Today, the clinic reported that it was starting to receive families from the affected part of Douma. It’s unclear if any of them were directly impacted by or injured in the chemical attack—but the attack has already triggered a new wave of displacement, and you’re already there to meet those who are fleeing. Even before the bombs fell Sunday, you had helped mobilize an emergency kitchen to feed thousands of families per day for the next month. You were already there, because the attacks didn’t stop—the need didn’t stop—when the world stopped caring. Your love is not dictated by the whims of the news cycle. 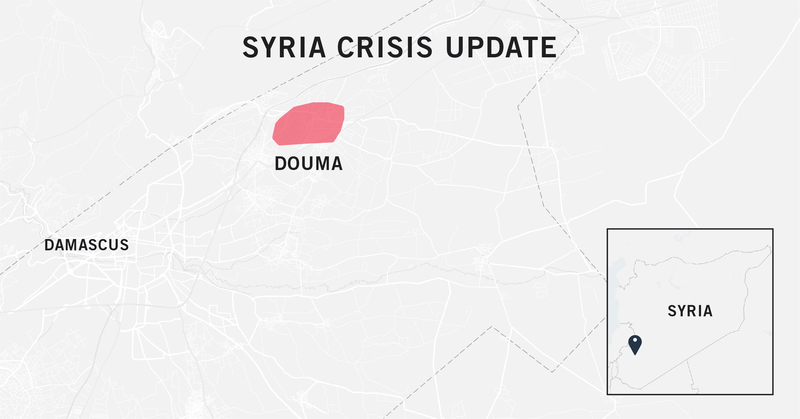 The situation in and around Douma is extremely volatile right now. Things are almost certain to change in the days and weeks ahead. We know more about the situation now than we did 48 hours ago. We are getting a better picture of how to respond to the latest wave of displacement caused by the chemical attack. And as the situation continues to develop, we’ll adjust our response as necessary to meet the most desperate, most unmet needs. And when the cameras are all packed up and the world moves on, we’ll stay—fueled by your love as we stand together with displaced families putting the pieces of their lives back together.